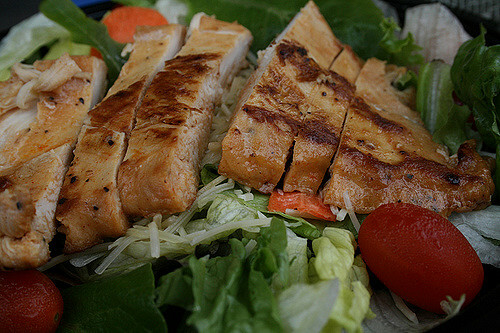 Protein is one of the main necessary components of a healthy diet. Without protein, our muscles and bones would weaken, our organs wouldn’t work properly and our hair, nails and skin would be in poor condition. Eating a lot of protein has many anti-aging benefits, not only on the inside of the body, but it will shine through to the outside as well. You probably recall from health class that protein creates the building blocks of muscle. Without sufficient protein intake, your body won’t maintain it’s strength and lose its muscle mass. It is very important to increase your protein intake if you are trying to lose weight. The protein will help keep your muscles strong, helping burn the extra fat and calories. This study suggests that the same holds true if you are strength training and/or exercising. To build up muscle for endurance or weight lifting, protein is a must. It has been shown that increasing protein will increase the body’s metabolic rate. When this happens, our bodies burn more calories, which will jump start weight loss. A study on the effects of protein on the body had some interesting findings. There were three groups of participants in this study, low, moderate and high protein intake. It was discovered that the participants who ate high protein over the eight week period, burned an average of 260 more calories than the low protein group. That is equal to about an hour of moderate exercise. If you want luxurious locks, then consider adding some extra protein to your diet. It will help your hair to grow stronger, which prevents breakage. It also helps prevent hair loss. If you are regularly eating a lot of protein, you should notice that your hair is shinier and noticeably thicker over time. Your fingernails are made with a protein called alpha-keratin. If there is a lack of protein in the diet, it can be easily seen in the condition of the nail. They may be thin, brittle, or even discolored. By adding more protein to your diet, your nails will be stronger, grow faster and have a healthy texture and color. Skin consists of collagen, which is one of the key components to slow down the signs of aging. An ample amount of collagen will keep the skin looking plump, with minimal fine lines and wrinkles. Ingesting a lot of protein will help your body produce more collagen, keeping that youthful appearance that we all strive for. When we think of healthy bones, we think of our mothers telling us to drink our milk. There is no doubt that calcium plays a major role in bone health, but one must also take protein intake into consideration. This study reports that an intake of animal sourced protein in post menopausal women, reduced the risk of hip fractures. Another study revealed that elderly individuals with a low protein diet, had a greater risk for developing osteoporosis and fractures. Increasing the protein in your diet can give your body the extra strength and nutrients that it needs to maintain health and outer beauty. By taking the above points into consideration and incorporating them into your daily lifestyle, you will see and feel a difference.